Murray Schisgal has an extensive career spanning plays, screenplays, fiction, anthologies, and as a producer of five feature films. Broadway: Luv, (Tony nomination for Best Play and Best Author), Jimmy Shine, All Over Town, (*Drama Desk nomination for Outstanding New Play), The Chinese & Doctor Fish, Twice Around the Park, (“A Need for Brussels Sprouts” & “A Need for Less Expertise”) and An American Millionaire. Off-Broadway and Off-Off-Broadway: The Typists and the Tiger (Vernon Rice Award, Outer Circle Award, Saturday Review Critics Poll Award), Fragments & the Basement, The Flatulist, Walter, The Pushcast Peddlers, 74 Georgia Avenue, Sexaholics, Extensions, The Consequences of Goosing, What About Luv? (A musical based on Luv), Road Show (revised, 2007 as Murder in the Drugstore), Playtime (revised 2009), Angels Wings (Off-Off-Broadway Award for Excellence). 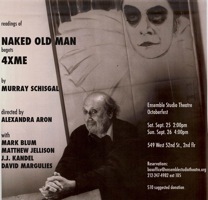 Unpublished plays published by Applause Books in “The Best American Short Plays” series: The Man Who Couldn't Stop Crying, First Love, Fifty Years Ago, Queenie, The Hunchback of Central Park West, The Hysterical Misogynist, and Naked Old Man. Other recent plays unpublished: 3XME, Death Moves Into Our Rent-Controlled Apartment. Star on the Playwrights Sidewalk for Off-Broadway Achievement by the Lucille Lortel Theater Foundation. Film, co-writer: Tootsie (Oscar nomination, Best Screenplay; The New York Critics Circle Award, Best Screenplay, The Los Angeles Film Critics Association Award, Best Screenplay, The National Society of Film Critics Award, Best Screenplay, Writers Guild of American Annual Award, Outstand Achievement of Comedy Directly Written for the Screen, The British Academy of Film nomination, Hollywood Foreign Press Association’s Golden Globe nomination. American Film Institute: #2 in The Funniest American Films, Writers Guild of America: #17 in 101 Greatest Screenplays); The Tiger Makes Out; Luv film based on play, Luv (screenplay by E. Baker). Television: “The Love Song of Barney Kempinski,” feature-length TV screenplay, (The National Academy of Television Arts and Sciences Emmy nomination for Outstanding Dramatic Program) and "Natasha Kovolina Pipashinsky", one-act of a trilogy of one-act TV screenplays. Novel: "Days and Nights of a French Horn Player", published by Little, Brown, 1980.